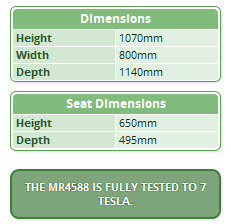 This new chair has been designed specifically to transport bariatric patients to and from the MRI suite and is MR Conditional for use up to and including 7.0 Tesla. With the increase of obesity becoming more of an issue in recent years, this chair allows patients to be transported safely to an open scanner. With no magnetic parts included in the design, the chair can transport the patient in to the scanner room. Not available to customers in USA at this time.